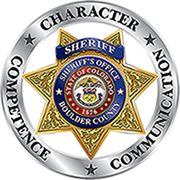 The Sheriff’s Office provides law enforcement services by contract to the Towns of Superior. Criminal code violation first appearances are brought before the court at 9:30 AM. Traffic violations and trials are held starting at 1:30 PM. All scheduled court dates are on the second Wednesday of each month. Morning session begin at 9:30 am. Afternoon session begins at 1:30 pm. Juvenile sessions begin at 3pm. Trials are scheduled for the 2nd Thursday of each month.